You can find our 8x10 metal garden sheds here. Metal sheds are ideal for those who would prefer a garden building that is lower maintenance and of a more modern construction. These sheds are resistant to corrosion and offer excellent strength and durability. 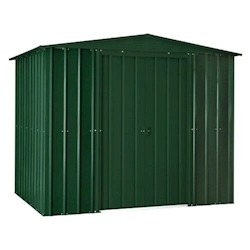 This popular size of metal shed is ideal for storing tools, equipment and anything else.